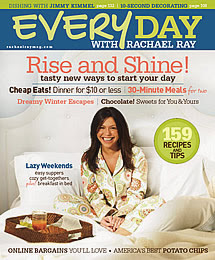 Doesn't it seem like forever since you got your Every Day with Rachael Ray magazine? Seems like it to me. But at least now we know what will be in the February issue. My favorite section, the 30-Minute Meal recipes, includes meals for two (which is good for me, since I hate math - no splitting ingredient amounts necessary). The recipes are Caponata Frittata with Grilled Panettone, Ground Meat Goulash with Macaroni, and Romano and Black Pepper Polenta with Mushroom Marsala. The Burger of the Month is The Rachael, which is a spin on a Reuben. I am always impressed by the creativity in the On Hand section, which lists five ingredients to add to the things you should have on hand already to create several different dishes. This month's theme is Thai dinners. We also get to learn how to use a waffle maker in unique ways, like making Jalapeño-Cheddar Waffle Sticks, and learn all about how to use carmelized onions. Kids will be interested in the tips on combining tacos and nachos. The celebrity featured in this issue is a heavy hitter - celebrity chef Rick Bayless. He and Rachael get together for a Mexican feast (of course) and his teenage daughter does some cooking. If you are thinking of throwing a party to celebrate the Chinese New Year, here's a good looking menu for you: Chile-Soy Sauce, Honey-Orange Sauce, Scallion-Ginger Sauce, Pork Dumplings, Vegetable Dumplings, Salt and Pepper Tofu, Scallion Pancakes, Sweet Sesame Balls, and Gin Ginger Ale. And for those of you who are having a Super Bowl Party, Rachael's got you covered. She offers some Express Lane recipes (meaning if you have what you should have on hand, you'll only have to pick up 10 items or less from the grocery store to make them): Mini Franks with Smoky Ketchup and Maple Mustard, Sweet and Salty Kettle Corn, Pulled Chicken Sandwiches, and Black-Bottom Cupcakes. I wasn't planning on throwing a party - but with a menu that yummy looking, I might have to reconsider. This issue's travel features take us for a romantic trip to Jackson Hole, Wyoming, the best spots in Cleveland (they couldn't have published this before I went to Cleveland? ), and to shopping spots in Santa Fe. Also in this issue are dinners that cost less than $10, a recipe for french toast made with croissants, recreating a tiramisu recipe and a chocolate-raspberry truffle bar for Valentine's Day. Don't know about you, but I am eagerly awaiting this issue! PS - Don't forget to vote for ERR in the Well Fed Food Blog Awards! Just stopping by to say congratulations and let you know I'm honored to be nominated in the category with you, Shauna, Biggles, and Allison. Thank you, Kalyn, that is very kind! I am honored to be in the same category as you! Voted for you! Congrats on your nomination darlin!